Looking for a fun 5K near Athens supporting a great cause? 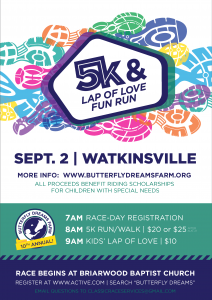 Saturday, Sept. 2, ButterFly Dreams will host a 5K at Briarwood Baptist Church, in Oconee County, to help fund horseback riding scholarships for students with special needs. 7 am Raceday registration, 8 am 5K run/walk, 9 am Kids’ Lap of Love. Register at www.active.com, search Butterfly Dreams. Posted in Announcements, Events. This entry was tagged 5k, event, exercise, health, healthy, race, run. Bookmark the permalink.